Work is stressful. That’s true for everyone, even if you love your job. “I have a mindfulness practice and I try to practice mindfulness formally a few times a week. 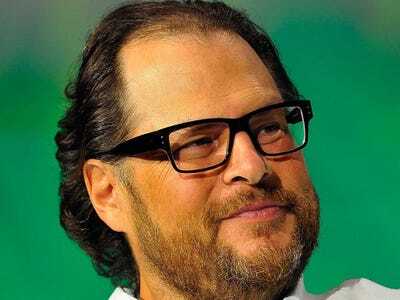 Like yesterday I did attend a mindfulness seminar that we had at Salesforce with 500 employees, where we had a mindfulness teacher come in,” he said. You can try mindfulness now; it only takes a few minutes. Plant both feet on the ground and feel the floor under them. Then go through your body, head-to-toe, relaxing any tense muscles: eyebrows, eyelids, jaw, tongue, shoulders, upper-back/shoulder blades, tummy, thighs, feet. Now just sit there a few minutes, breathing naturally, noticing your body, noticing any thoughts. Don’t react. Don’t fix things. Don’t fidget (as best as you can). Don’t make lists. Don’t do anything, just watch yourself for a few minutes and notice yourself, body and mind, allow yourself to relax. If you can’t relax, just notice how your stress feels in your body. Chade-Meng Tan and others to lead the crowd. There’s plenty of research that indicates that this kind of mindful meditation lowers stress and helps us make better decisions.